Bradley Walker Tomlin, No. 8, 1952, Oil and charcoal on canvas; 65 7/8 x 47 7/8 in. ; 167.3225 x 121.6025 cm.. Acquired 1955. Phillips Collection, Washington D.C.
No. 8 (1952) was the first of two late abstract expressionist works by Bradley Walker Tomlin to enter The Phillips Collection in the 1950s. Purchased in 1955 from Tomlin’s dealer, the Betty Parsons Gallery in New York, Duncan Phillips called this painting “Blossoms” and referred to pictures with its particular style of short, thick brushstrokes as Tomlin’s “petal paintings” for their resemblance to falling flower petals. Painted in 1952, No. 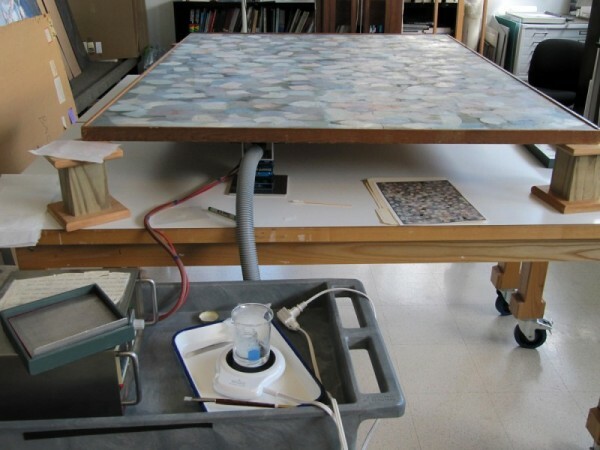 8 was 60 years old when it came into the Conservation Studio at the Phillips last year, and the painting was showing its age. Paint around fine cracks in various “petals” of color was beginning to lift and flake off, and over the years a layer of fine, yellowish grime had also accumulated on the unvarnished paint surface. The overall appearance was dull with diminished color contrasts. No evidence of previous restoration was observed on the painting or found in files, suggesting this was the picture’s first comprehensive conservation treatment since it was painted. The goal of treatment was to improve the painting’s overall condition and appearance with as little intervention or alteration of original material as possible. The media line of No. 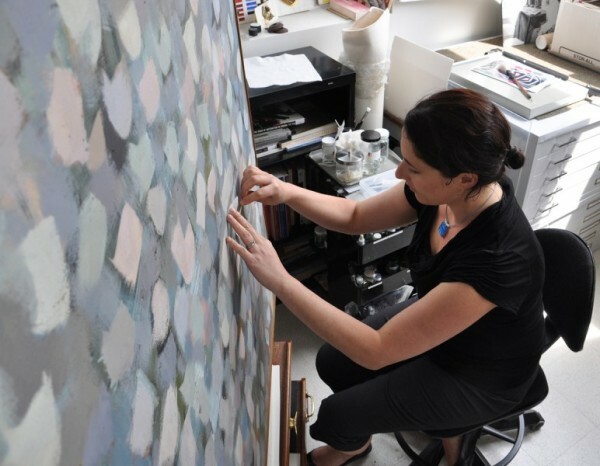 8‘s label reads “oil on canvas,” but Tomlin’s is not a typical oil paint film. In some places, the paint surface is glossy and cohesive, and in others it is matte with a slightly rough texture. In a few areas, the paint has a soft, velvet finish–here, it is thought Tomlin may have mixed wax with his oil paint to get that effect. 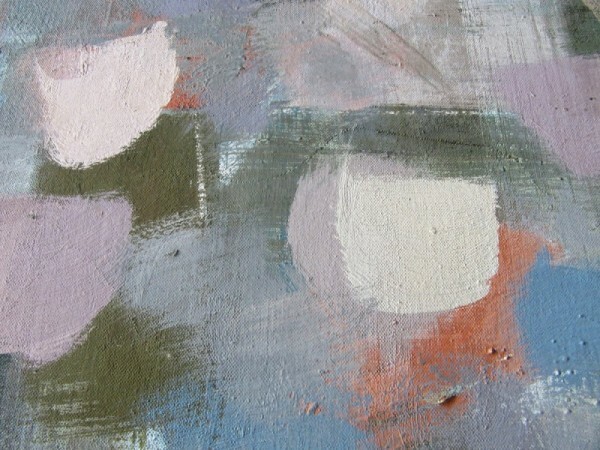 Tomlin also sketched in chalk and charcoal over dry paint, and some of this dry media remains visible in the final composition. 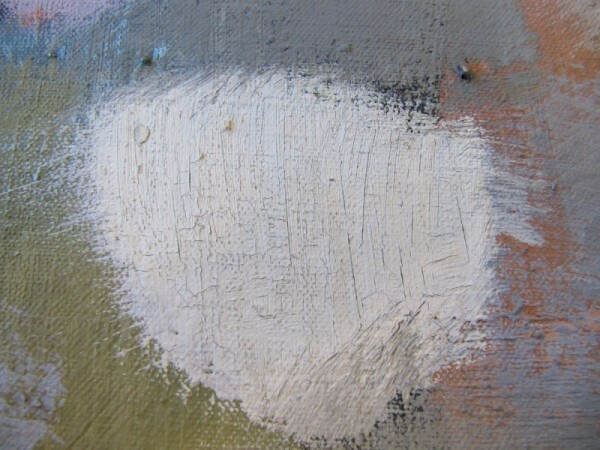 Cleaning this painting in a conventional manner–either by gently rolling a wet cotton swab over the paint surface or using dry techniques–would be impossible to do without removing or otherwise altering original material. The chalk and charcoal would be easily wiped away, and any friction on the surface would burnish the matte areas, especially where Tomlin mixed wax into the paint. …Read part two tomorrow. Detail of the matte, unvarnished paint surface with lines dry media–white chalk and black charcoal.